In this article, I thought that I would pitch one of Honeywell’s oldest smart thermostats (RTH6580WF) against one of their newest (Lyric T5) to see if over time any significant changes have been made. I mean, surely in most respects the Lyric T5 will be the clear winner, won’t it? The first and most obvious difference between these two Honeywell thermostats is in their size and design. Born three years apart (the RTH6580 was launched in 2012 and the T5 was launched in 2015) the older thermostat shows its age. It has a large case which is largely plastic. The T5 is slightly taller (4 inches vs 3.5 inches) less wide (4 inches vs 5.8 inches) and slightly thinner (1.2 inches vs 1.5 inches) than the RTH6580. Although the T5 is perhaps not as eye catching as the Nest or Ecobee3 Lite, it is a huge improvement over the 6580. Like most top smart thermostats, the T5 is all screen. There is no bulky plastic case and no ugly plastic buttons, just a stylish, thin bezel that surrounds it. 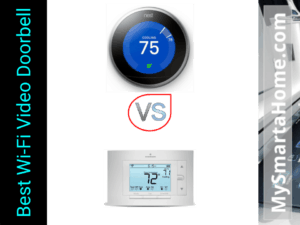 Although there is not too much difference in the overall size of these two thermostats, there is a large difference in their screen size. The RTH6580 screen is only 6.5” square, whereas the Lyric T5 has a 3.5” diagonal screen. The T5 screen is different. This makes it easier to read from the other side of the room. The T5 is operated via a touch screen whereas the the RTH6580 doesn’t have a touch screen but is operated by the buttons on the front. 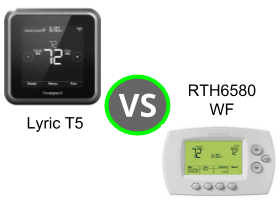 I am rubbing my head in disbelief as I write this but it seems that the older Honeywell thermostat, the RTH6580 is compatible with more smart home systems than the Lyric T5 is. A smart home contains lots of devices that connect to the Internet and that can be controlled remotely via apps on smartphones or using your voice on interactive speakers. Another important quality of a smart gadget is that they interact with other smart gadgets. The Echo are a range of interactive devices built by Amazon that respond to voice commands. The Echo range includes a couple of interactive speakers and and a couple of interactive screens. All Echo products are powered by a talking digital assistant, called Alexa. Echo products connect to an increasing range of other smart devices allowing those devices to be controlled by voice commands. Both of these thermostats are compatible with Echo products. Google Home is Google’s smart home system. It is the name of the two interactive speakers (Google Home and Google Home Mini). These devices, like the Echo, are powered by a talking digital assistant, unimaginatively called “Google Assistant”! The 6580 and the T5 are both compatible with Google Home. HomeKit is Apple’s smart home system. The Lyric T5 is compatible with this system whereas the RTH6580WF is not. Like the Amazon and Google system, HomeKit is “voice activated” but unlike those systems you do not need an interactive speaker to make it work. Siri is the voice behind Apple’s system. Instead, you just need an iPhone to give it some basic functions and Apple TV to provide the real power features. Up until the coming of the Amazon Echo, two of the most popular smart home systems were Wink and SmartThings. It surprises me that the older Honeywell thermostat is compatible with Wink and SmartThings and that the newer thermostat will not work with either of them! Wink and SmartThings are compatible with hundreds of different devices. Powering these system are smart hubs or controllers which all the devices connect to. The smart hubs and connected devices are controlled via iOS or Android apps. Neither Wink or SmartThings have “built in” digital assistants, although they are both compatible with Amazon Alexa and Google Assistant. The last system that I want to mention is IFTTT or If This Then That. IFTTT is very different than most other “systems” because it doesn’t rely on smart hubs ,interactive speakers or digital assistants. Perhaps it is just too flexible to be labelled as a system at all! If all this intrigues or confuses you then I have written a massive guide to it that you can read here. Safe to say though that both of these thermostats will work with IFTTT. Go here if you want to know more about the Lyric T5 and IFTTT or read this page for more details for the RTH6580WF works with the system. Not surprising given the age difference between the RTH6580 and the Lyric T5, the setup process is slightly different. Both thermostats are of course physically installed in a similar way in that they need to be connected to series of wires and then fixed to a base plate on the wall. But it is after this that the approach is different. The Lyric T5 at this point gives you the option to complete the setup process using the Honeywell Home app, which is great because it guides you through the process step by step with great instructions and images. The app contains everything, you do not need to touch the thermostat itself. To find out more, just watch this. The RTH6580 after it has been fixed to the wall needs to be set up by following written instructions or video instructions and by pressing buttons on the unit itself. The Total Comfort App that it uses, doesn’t guide you through the setup process. The next difference between these two thermostats is that the T5 has a proximity sensor whilst the 6580 doesn’t. A proximity sensor detects when there is movement close by and wakes the screen up. This is a common feature in some of the most popular smart thermostats such as the Nest Learning Thermostat or the Ecobee3. After a few seconds of inactivity, in order to save power, the screen will dim. The 6580 has a much simpler backlit screen that dims after a few seconds of inactivity but the screen will not light up when you approach it. Instead you need to press one of the buttons on the front to do this. The home away feature is also called geofencing. The Lyric T5 has this feature built directly into the app, whereas the RTH65 can only do this if a third party app called IFTTT is used. I explain IFTTT in more detail in a later section. Geofencing turns a smartphone into an on/ off switch for the Lyric T5 and RTH6580. Using the “Honeywell Home” app, a boundary has to be created on an electronic map. When this boundary is crossed by a person carrying their phone (loaded with the app) the thermostat will be turned on and off- depending on whether a person is leaving home or returning to it. The next difference that I want to tell you about is that these thermostats use different apps. Because the apps are different, the requirements for using them are also different. Both are available for iOS and Android devices. The Lyric T5 uses the “Honeywell Home” app, which is designed to be used with a variety of Honeywell smart devices such as; the T5 and T6 thermostats, smart cameras and water leak detection equipment. It is one of Honeywell’s most up to date apps. Key features of this app (for a thermostat) include; simple set up, change temperature settings, geofencing and scheduling. To a brief walk through of this app, watch this video. If you want to download this app on your iPhone or iPad, your device will need to be running iOS 10 or later. If you want to use it on an Android device then the exact requirement vary by device. Just visit the Play Store on your chosen device to find out if it is compatible. In contrast, the RTH6580WF uses the Total Comfort App. 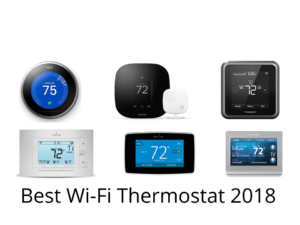 The Total Comfort app is a much older app than the Honeywell Home and was designed specifically to provide remote access to Honeywell smart thermostats. I don’t think that this app can be used with other types of smart devices. A more in depth tour of this app can be watched here. If you want to use this app on your iPhone or iPad, then it needs to be running iOS 9 or later. If instead you want to run the app on an Android device, it requires version 4.1 or later of the software. 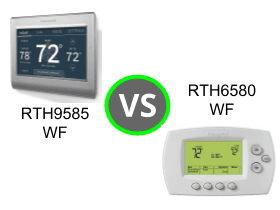 Both of these thermostats are compatible with 24V HVAC (heating, ventilation air conditioning systems) which are the most common types of heating systems in the US. They will also work with conventional and heat pump systems and the RTH6580WF and the Lyric T5 support multiple stages of heating and cooling. In conventional systems these two Honeywell thermostats support up to two stages of heating and two of cooling. But for heat pump systems, they support up to three stages of heating and two stages of cooling. Finally both of these smart thermostats are compatible with gas, electric, oil or dual fuel systems. However, if you are still unsure then this video explains the most common types of heating systems found in our homes. And once you are sure that you have a 24V system, work through this free Honeywell compatibility checker to guarantee that either the Lyric T5 or the RTH6580WF will work in your home. 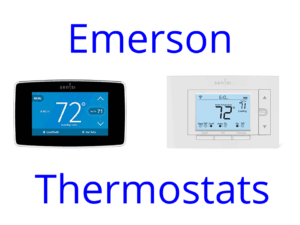 These two thermostats both have the same scheduling or programming capabilities. Simply put, this is the ability to organise on a daily basis when your thermostat turns on and off and to set a “target” or “preferred” temperature that you want your home to be. And per day, you can set up to 4 different time periods. Even though the thermostats use two different apps, you can set up your schedule via the app. You can also create your schedule using your a free Honeywell account that you can access via a web browser, which is called My Total Connect Comfort. If you want a quick quick demonstration of it, watch this. The next similarity between the two thermostats in my comparison is in how they are powered. Both of them are powered by a “c” or “common” wire. HVAC systems that include a “c” wire tend to be quite modern systems and these systems tend to have five of more colored wires. The best way to find out if your system has a “c” wire is to uninstall your existing thermostat and take a look at the wires. Take a look at this video to find out how. The wires should be connected to terminals that are labelled with different letters. Some people might be tempted to identify a “c” wire by its color but this can’t be done as a “c” wire can be any number of different colors- there is no standard color that installers use. If after searching you realise that your system doesn’t include a “c” wire, they are still ways that you can install either the Lyric T5 or RTH6580WF successfully. Honeywell have made this video which explains your main options if your system has no “c” wire and this video provides step by step instructions for substituting your “g” wire for your “c” wire. Neither of the two thermostats in my comparison display a weather forecast on the unit. You can access a weather forecast but you can only access this via the app or your online account. Unfortunately, neither of these thermostats will work with any HVAC add ons or accessories, such as humidifiers or dehumidifiers. 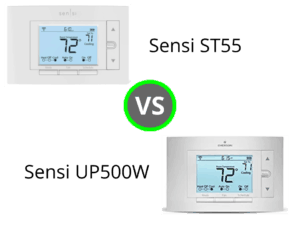 And to finish off this post, let’s have a look at each thermostats pros and cons. This is a fantastic thermostat if you want great design with lots of features and you own an "Apple" Smart Home. If looks don't interest you then what are you waiting for? Powerful features and a great price. Buy one now.